Recently I co-hosted a baby shower for a friend, and her sister, Amanda Easley, brought this amazing Chocolate Walnut Salted Caramel Torte. She said she was willing to share her recipe with me, so I get to pass it along to you. If you are looking for other amazing chocolatey desserts, check out my Better Than Anything Chocolate Trifle and my Chocolate Eclair Cupcakes. This dessert was beautiful and a huge hit with our guests. 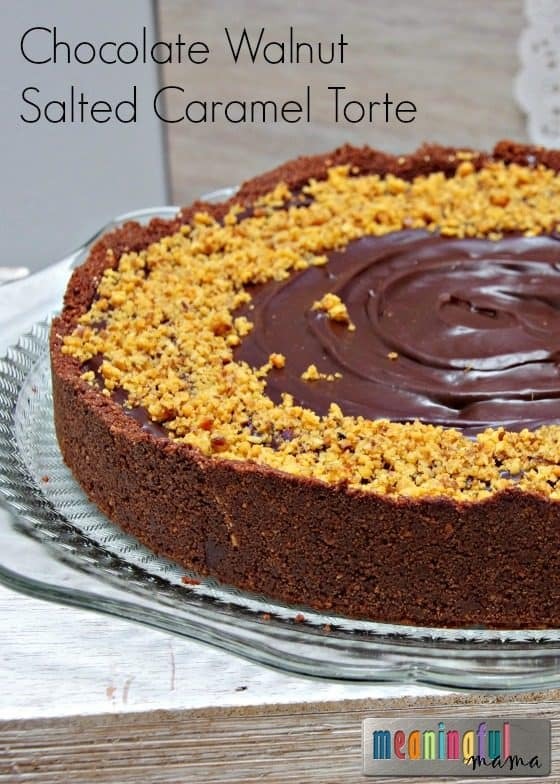 With Valentine’s Day coming up, this Chocolate Walnut Salted Caramel Torte recipe is great to have on hand for your own celebrations. In food processor, pulse one pack of graham crackers until fine. Add half a cup toasted walnuts and 6 oz of melted butter. Pulse this until well combined. Press into the bottom of a tart pan or springform pan. I like to get a good edge by using a measuring cup to press the sides up. Place remaining walnuts over the crust and gently press them into the crust slightly. Make salted caramel sauce from Food of our Lives. “It is seriously best sauce of my life,” notes the baker of this torte! Gently pour a cup to a cup and a half of caramel over the nuts making sure it’s evenly distributed. Set aside to cool and thicken. -it can be set in the freezer for 5 to 10 minutes to cool quickly to make sure it’s done in time for the chocolate. Place 3/4 a cup of heavy whipping cream in a saucepan. Bring to a simmer (until milk is visibly heated but not boiling). Remove from heat pour in one cup of semi-sweet chocolate chips. Let’s sit for about 3 minutes. At this point you want a mostly firm caramel before you add the chocolate to assure you get that good layering effect. Gently drizzle the chocolate over top making sure to cover all of it evenly. Chill for at least 2 hours before serving. This is a great dessert to make ahead of time and saves well for at least 3 days in the fridge. Enjoy! 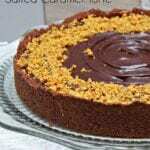 This chocolate walnut salted carmael torte is a wonderful dessert for showers, holidays and parties. Chill for at least 2 hours before serving. This is a great dessert to make ahead of time and saves well for at least 3 days in the fridge. Enjoy! 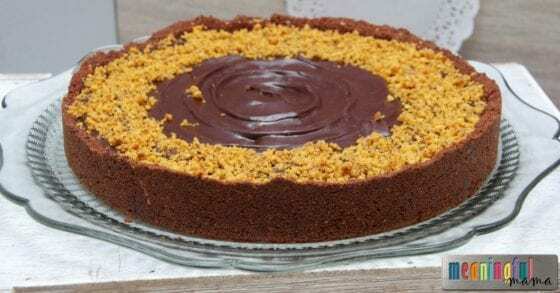 This Chocolate Walnut Salted Caramel Torte will be a fabulous recipe to have on hand whether you are hosting your own baby shower, celebrating a holiday or just need a special treat on hand.